The next generation mobile communication networks (4G) have the challenging target of The next generation mobile communication networks (4G) have the challenging target of providing a peak data rate of 1 Gigabit per second local area and 100 Megabit per second wide area. The ability to offer such high data rates in 100MHz bandwidth requires overall a very high spectral efficiency, and hence the need for multi-antenna techniques (MIMO) with spatial multiplexing, fast dynamic link adaptation and packet scheduling, wideband access techniques, and most likely non-contention based spectrum sharing among multiple operators. Many of these required technology components and techniques are well researched and established. Adaptive PHY-MAC Design for Broadband Wireless Systems explains how one can integrate and optimise their use in providing the target cell data rates with high availability. 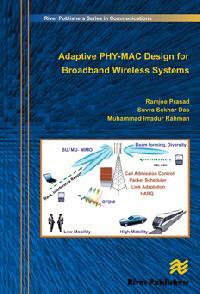 The authors address the ability to cope with interference and enhanced physical layer processing, and simultaneously, the multifaceted system level design. Focus is also on the selection of technology components and techniques, which leads to the highest spectral efficiency and peak data rate availability with reasonable Quality of Service (QoS) support, such as improved outage scenario, reduced delay, guaranteed bit rate, etc. In short, this book will answer questions such as, how individual techniques relate to each other, how can we benefit the gains by suitable combinations of different technologies and how to choose different technological solutions in different scenarios, etc.